In these days I tested the operating system Navigatrix that I will use on my notebook to make it a perfect tool for navigation. 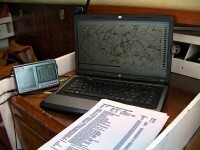 It is installed on a USB key and disables the notebook’s hard disk to protect it and consume less, and above all has pre-installed all open source softwares that can be useful in a boat. Everything seems to work perfectly. The main software is Open CPN , much more than just a chartplotter, with a small USB GPS I see instantly my position on nautical vector maps and adding a AIS receiver on the same maps I see (I willsee) ships in the vicinity with all their data. Optimal security integration for an area as the sea of ​​Ireland characterized by heavy traffic, tidal currents and strong winds. I need the system works for the first week, then out of the continental shelf things should become more manageable until the mouth of the Amazon where there are the same risks. I could also install a Radar Target Enancher or a radar detector like the Mer-Veille . I have excluded the radar for costs and power consumption problems. The other software I tested, also this already included in Navigatrix is used to receive weather maps weatherfax transmitted by radio (JWX). Combined with the less expensive radio that can receive SSB (Degen DE1103) and with an antenna made ​​by a metallic clip attached to the backstay and a piece of coaxial cable, I obtained without problems a perfect map transmitted by the Northwood station.